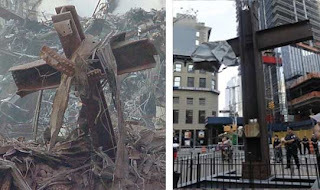 A New York judge has dismissed a lawsuit filed by American Atheists, ruling that a pair of World Trade Center beams in the shape of a cross can be included in a memorial museum of the 2001 9/11 terror attacks. Federal Judge Deborah Batts of the Southern District of New York ruled Thursday that display of the beams is permissible because they bear historical importance. American Atheists filed the lawsuit in July of 2012, arguing that the "government enshrinement of the cross" was a "violation of church and state and the establishment clause set forth in the 1st amendment by case history". The World Trade Center cross is a steel crossbeam that held up when the World Trade Center towers collapsed on September 11, 2001. The cross was moved in July of 2012 from a nearby church to the 9/11 Memorial & Museum, located at ground zero in Lower Manhattan. Father Brian Jordan, a Franciscan priest who ministered to workers clearing the area after the attacks, led a ceremonial blessing of the cross. Museum curators plan to display "the cross" as one of hundreds of artifacts collected from the rubble of the incident. Some first responders say the cross that was found sticking out of the wreckage with what appeared like Jesus' robe gave them a great deal of comfort at a difficult time. "We are angry that we have to have this fight."